Partners since day one: Porsche has been working closely with the new CODE University for digital product development in Berlin ever since the university was founded. Through this partnership, the Stuttgart-based sports car manufacturer is once again emphasising the relevance of new skills and ways of thinking on the road to its digital transformation. Porsche and CODE plan to launch joint projects and promote close collaboration for the purpose of exchanging knowledge. The CODE University of Applied Sciences is a private, state-recognised university that offers degree programs in software engineering, interaction design and product management. From the very beginning of their studies, students work on their own projects in international and interdisciplinary teams of software developers, interaction designers and product managers – whilst also working closely with companies and organisations. 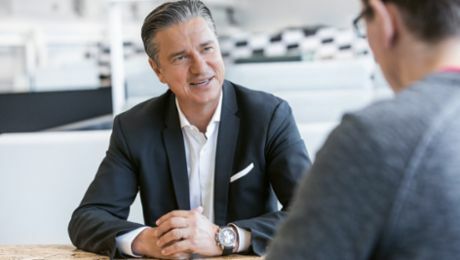 “The digital transformation has both a direct and indirect impact on the activities and roles that our employees will undertake in the future”, says Andreas Haffner, Member of the Executive Board for Human Resources and Social Affairs at Porsche AG. According to Haffner, completely new skills will be required in many of the company’s departments in the future as a result of the transformation. The high level of practical relevance and its agile approach to project work are what make this university of particular interest to Porsche. Haffner: “CODE aims to educate the digital pioneers of tomorrow. It is precisely these pioneers that we need at Porsche to develop our products, new digital services and the mobility concepts of the future, as well as to enhance our internal processes." When it comes to the future of the collaboration, the sports car manufacturer is keen to establish a lively exchange between the university and the Porsche Digital Lab, which also has its headquarters in Berlin. 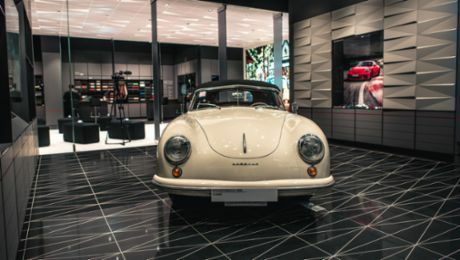 This Porsche think tank for IT pre-development and research is just a short walk away from CODE, and the partners plan to use the proximity of the two sites to link research and business experience as closely as possible. For Lutz Meschke, Deputy Chairman of the Executive Board and Member of the Executive Board for Finance and IT, cooperating with CODE is another step towards a digitalised future: “Our industry is currently undergoing its greatest upheaval in 100 years. To boost our innovative strength during this time of change, we need to be open to partnerships like the one we have established with CODE. We need the perspective of digital natives, of people who think differently and work on topics that may not have even crossed our minds”, says Meschke. He also emphasised the importance of topics such as philosophy, ethics and society when it comes to new technologies such as artificial intelligence or blockchain concepts. New technologies, new products, new competitors: Porsche CFO Lutz Meschke on transformation in turbulent times.